When Marin returned to the United States from Europe in 1909, he found New York City rapidly transforming. The tall buildings known as skyscrapers rose ever higher. The most famous skyscraper of that early era was the Woolworth Building, completed in 1913. Designed by architect Cass Gilbert to house the corporate headquarters for the F. W. Woolworth Company, the neo-gothic skyscraper at 233 Broadway Avenue was, at 792 feet, the world’s tallest building until it was surpassed by the Empire State Building in 1931. The grand scale of the building, combined with its homage to gothic style, led to its nickname, “the cathedral of commerce.” Marin’s sketches of the Woolworth Building laid the foundations for his watercolors and etchings of the famous building. The whole city is alive — buildings, people, all are alive — and the more they move me the more I feel them to be alive. It is this moving of me that I try to express. The Woolworth Building was in an area that Marin loved to depict: City Hall Park. The open land of the park afforded the artist the ability, rare in Manhattan, to stand back enough to get good views of tall structures rather than having to look up at them towering directly above him or to see them lined up behind other structures farther down a street. 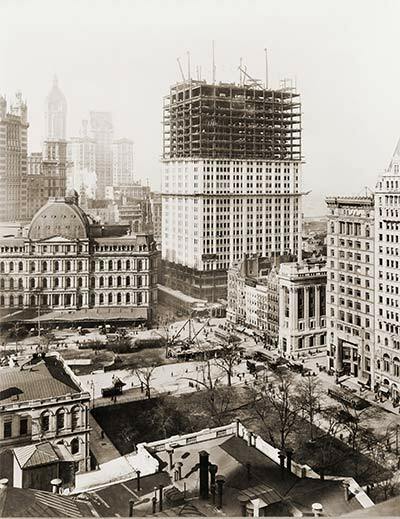 The structures around City Hall Park became emblems of his modernism – the Brooklyn Bridge, in easy walking distance from the park; St. Paul’s Chapel, just down Broadway; City Hall itself; and two buildings that were under construction simultaneously during an exciting stretch of 1912 and early 1913 — the Municipal Building, and the Woolworth Building. American Studio, South Street, N. Y., circa 1917, photograph, Library of Congress, LC-USZ62-107489, https://lccn.loc.gov/93504630. The Brooklyn Bridge is at the left, close to City Hall Park, where the Woolworth Building and the Municipal Building stand at the right. Some of Marin’s greatest images of the Woolworth Building were made in the form of etchings. In Woolworth Building, No. 1, the artist inked each print from the copper plate differently. Each image is a unique interpretation of the image exploring the vast energy of the towering skyscraper. Bain News Service, Woolworth Building, circa 1912, glass plate negative, 5 × 7 inches (12.5 × 17.78 cm. ), © George Grantham Baine Collection, Library of Congress. At the left is the Woolworth building and at the right is the Municipal Building. I have just started Some Downtown stuff and to pile these great houses one upon another with paint as they do pile themselves up there so beautiful, so fantastic. The first style comprised detailed, traditional architectural renderings in traditional linear perspective. John Marin, Woolworth Building, Manhattan, 1912–1915, graphite on paper with linen surface, 11 1/16 × 8 ⅝ in. (28.10 × 21.91 cm. ), Arkansas Arts Center Foundation Collection: Gift of Norma B. Marin, New York, New York. 2013.018.282. Works in the second style were roughly sketched renderings giving more stress to textures. John Marin, Woolworth Building under Construction, 1912, graphite on paper, 10 × 8 in. (25.4 × 20.32 cm. ), Arkansas Arts Center Foundation Collection: Gift of Norma B. Marin, New York, New York. 2013.018.278. ​​John Marin, Woolworth Building under Construction, 1912, graphite on paper, 10 × 8 in. (25.4 × 20.32 cm. ), Arkansas Arts Center Foundation Collection: Gift of Norma B. Marin, New York, New York. 2013.018.288. Works in the third style were fragmented, exaggerated views in which he felt free to distort perspective and structure for modernist expression. John Marin, Woolworth Building, Manhattan, 1912-1914, graphite on paper, 8 × 4 ⅞ in. (20.32 × 12.38 cm. ), Arkansas Arts Center Foundation Collection: Gift of Norma B. Marin, New York, New York. 2013.018.258. John Marin, Untitled (Woolworth Building), 1912–1913, graphite on paper, 9 ½ × 7 ⅜ inches (24.13 × 18.73 cm. ), Arkansas Arts Center Foundation Collection: Purchase. 1979.006.001. John Marin, Woolworth Building under Construction, 1912, watercolor and graphite on textured watercolor paper, 19 ⅝ × 15 ⅜ in. (49.85 × 39.05 cm. ), Arkansas Arts Center Foundation Collection: Gift of Norma B. Marin, New York, New York. 2013.018.011. All three styles were part of Marin’s process of developing the completed watercolors and etchings of the Woolworth Building. An incomplete watercolor in the Arts Center’s collection shows us another stage in the development of these images, as the artist decided what point of view to use and what colors to use. He stopped work on this watercolor at an early enough stage for us to see how he drew the structure of the image before beginning to add color. They — the drawings — were mostly made in a series of wanderings around about my City — New York — with pencil and paper in — short hand - writings — as it were — Swiftly put down. Marin completed a series of modernist, cubist-inspired watercolors of the Woolworth Building in 1911, 1912 and 1913. All of these images express the implied energy and motion Marin felt in the towering structure. In 1913, Marin’s dealer, mentor, and friend Alfred Stieglitz first exhibited some of the completed watercolors of the Woolworth Building and other subjects from January 20 to February 15, 1912, at the Little Galleries of the Photo-Secession, known as 291 for its address on Fifth Avenue. John Marin, Woolworth Building under Construction, circa 1911, watercolor on paper, 19 ½ × 15 7/16 inches (49.6 × 39.2 cm. ), National Gallery of Art, Washington D.C.; Gift of Mr. and Mrs. John Marin, Jr., 1987.19.2.a, SR.13.81. John Marin, Woolworth Building, No. 28, 1912, watercolor and graphite on paper, 18 ½ × 15 9/16 inches (46.99 × 39.53 cm. ), National Gallery of Art, Washington, D.C., Gift of Eugene and Agnes E. Meyer, 1967.13.8, SR.12.66. This is one of the watercolors shown at 291 Gallery and then at the Armory Show in 1913. John Marin, Woolworth Building, No. 31, 1912, watercolor and graphite on paper, 18 ½ × 15 11/16 inches (21.59 × 39.85 cm. ), National Gallery of Art, Washington, D.C., Gift of Eugene and Agnes E. Meyer, 1967.13.9, SR.12.68. This is one of the watercolors shown at 291 Gallery and then at the Armory Show in 1913. John Marin, Woolworth Building, No. 32, 1913, watercolor and graphite on paper, 18 5/16 × 15 ⅝ inches (46.51 × 39.69 cm. ), National Gallery of Art, Washington, D.C., Gift of Eugene and Agnes E. Meyer, 1967.13.11.a, SR.12.69. This is one of the watercolors shown at 291 Gallery and then at the Armory Show in 1913. Two days after the close of Marin’s solo exhibition, his works traveled a few blocks to become part of the sensational International Exhibition of Modern Art. This great exhibition was known as the 1913 Armory Show because it was held in the 69th Regiment Armory on Lexington Avenue. The Armory Show introduced a wide American public to European and American modern art in a variety of styles, from romanticism, to impressionism, to post-impressionism, to cubism, and futurism. While the radical European artists gained the most press attention, American modern artists like Marin actually made up the majority of the exhibition. Marin’s graphite drawings of the Municipal Building and the Woolworth Building and other structures around City Hall Park were rendered in three basic styles that he deployed for different purposes. John Marin, Woolworth Building, No. 1, 1913, etching with unique inking, image: 10 ⅞ × 8 ⅜ inches (27.7 × 21.3 cm. ), plate: 11 ⅞ × 9 ⅞ inches (30.1 × 25.1 cm. ), sheet: 15 9/16 × 11 ⅝ inches (39.6 × 29.5 cm. ), Philadelphia Museum of Art, The J. Wolfe Golden and Celeste Golden Collection of Marin Etchings, 1969, 1969-81-86, CZ.113, Copyright: © Estate of John Marin / Artists Rights Society (ARS), New York. The Woolworth Building continued to be a favorite subject of Marin’s long after it was completed. John Marin, Woolworth Building, Manhattan, circa 1921, graphite on paper, 10 × 8 in. (25.4 × 20.32 cm. ), Arkansas Arts Center Foundation Collection: Gift of Norma B. Marin, New York, New York. 2013.018.287.